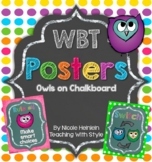 This document has the 5 WBT rules in a ready to print and cut size to place in pocket charts as reminders for students. There are also letters for positive reinforcement and practice reminders that can be sent home. 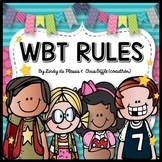 Included is a variation of the WBT-ish rules that I use myself in the classroom. These posters are for the Whole Brain Teaching classrooms. Only included in the packet are the posters for the rules. Follow Directions Quickly Raise a hand to speak, Raise a hand to leave your seat. Make Smart Choices Make your dear teacher happy. Enjoy! I am going to use this powerpoint to show the students what the super improvers wall is all about. You can edit it to match your titles on your own wall. Class Rules posters inspired by Whole Brain Teaching in cool purples, blues, and greens. Use my class rules, or make your own with the EDITABLE PowerPoint document included! 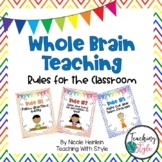 Whole Brain Teaching Rule Posters. One poster for each rule. Print on regular printer paper and then laminate. Log-in sheet for student to use at home. Quick overview for teacher. Great way to remind students to practice at home. 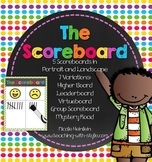 Go to Whole Brain Teaching to obtain the Super Speed Read and Super Speed Math documents to use with the students.